"Importance of Church Policies and Procedures"
I hope you are having a blessed day. I have a quick note below on why church policy and procedures are so important to the entire church as a whole along with free sample policy and procedures. If you thought QuickBooks was too complicated for your church accounting and wanted something more simple yet efficient you have to check out Aplos - Church Accounting Software below! Our church found Aplos software that is affordable and I had to share - I dearly love it! Also, I included some great information on Church Internal Controls to help keep your church safe. Shepherdbase - Are you finding yourself overwhelmed in the office? 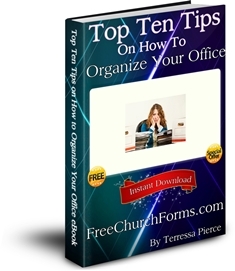 Shepherdbase will save you a lot of time in your church office. Shepherdbase - Church Membership Database will track memberships (unlimited with one time fee), contributions, attendance and much more On Sale Right Now Through March 31, 2014 for ONLY $29.99 by High Demand so Hurry & Enjoy these Savings! What are policy and procedures? A Policy is a statement that defines the authority required, boundaries set, responsibilities delegated, and guidelines, established to carry out a function of the organization or church. In other words, policies are "what" a company does or who does the task, why it is done, and, under what conditions it is done. Policies answer questions that arise during unique circumstances. Procedures tell "how" as task is done in a detail with each step taken to complete the process. Why are policy and procedures important? Written P&Ps (policies and procedures) provide the framework for a church or organization's entire operation. They provide clear direction for employees or volunteers as well as insights into missions, values, and ethical standards. There is normally a department within the organization that prepares these policy manuals which are then distributed to employees/volunteers and used for orientation and training. 1. Guide to Duties - Procedures are different from policies in that they provide a step-by-step guide on how to perform a certain task or operation within an organization. Example: Church might outline a procedure on which reports to print and at what times of the month are they due. This offers a guide to employees/volunteers that helps them develop consistency in performing their work activities. Also, this protects against delays and mistakes that can lead to embarrassment at best and termination at worst. 2. Legal & Proper Protection - Policy manuals typically will cover any legal or ethical concerns related to an organization or employment situation. These policies help protect employees/volunteers from making decisions that could lead to a both personal and legal repercussions. It also guides them on ethical standards so they will not be caught in unfamiliar situations without preparation. 3. Safety - P&Ps should provide for the physical and emotional safety of employees/volunteers. For instance, if there is any job-related duties that involve proper use of equipment and steps to perform operations safely. These procedures can help prevent serious injuries or even death. Also, organizations often have policies against harassment, bullying and workplace violations as a way of reducing the number of incidents. 4. Alignment with Mission - Policy manuals typically provide a framework for implementing an organization's goals and mission. Church leaders usually want to develop an organizational culture with values that align with the church's mission and purpose. I have recently added many new sample policy and procedures that you can download, customize and print for free - just click link below. 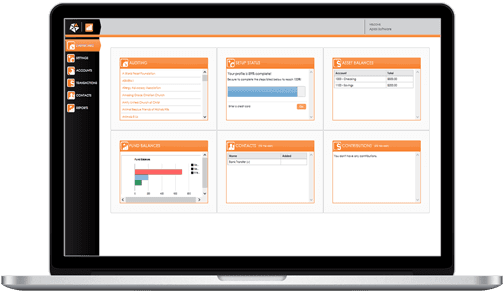 Are you tired of complicated church accounting software? If yes, then you need to try Aplos! It is Simple and Efficient! Small churches often have volunteer help and sometimes frequent turnovers so it is so important to have an accounting system set up that is simple and super easy to learn and use! If your staff can input checks into a checkbook register then they can use Aplos! I personally use Aplos at our church, and I couldn't be more happier! This accounting software is as easy as using my checkbook register, in fact it's set up similar to a checkbook register, but you get all the reports and database inquiries too - I love it! Next time my Pastor leaves for India for two months - guess what - he will still have access to the church accounting with graphs on the front page showing just how much is in the missions fund at any time he needs to as long as he has internet access to get online! Extremely Easy to Set Up and Use! I couldn't believe how affordable this software was when our church found it, we just knew there had to be a catch somewhere! $12.00 for a Single User or Only $20.00 for Unlimited Users! There is a 15 Day Free Trial and FreeChurchForms.com readers will receive a special discount of 25% Off for 6 Months simply by entering the Promo Code: FCF in the promotion code box when ordering if you are a new Aplos customer! This pricing also includes the accounting module, budget module, bank reconciliation and bank integration module, check printing module, accounts receivable module and the accounts payable module. The Donor Management module that includes the online donation integration is only $10.00 a month extra. So the most you could pay is $30.00 a month if wanted everything! 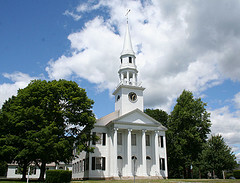 Click here for more details on Aplos - Church Accounting Software. Are you keeping your church or non-profit safe? Internal controls are measures utilized by an organization to safeguard assets from waste, fraud, and ineffeicient use. Internal cash controls can be a sensitive issue in churches or non-profits, especially those that relies on volunteers. Your organiztion is built on the concepts of honesty, truthfulness, and mutual trust. However, speaking as a church volunteer myself, most of us realize that internal controls not only protect the organization's interestes, but can also protect the staff members from false allegations. How do you set up a system of internal controls? Click the link below to find out how to step up this system. Click Here for More Information on Church Internal Controls. Shepherdbase (Church Membership Database) is On Sale Right Now Through March 31, 2014 by High Demand for ONLY $29.99. You will also receive 2 Offering Envelope Templates, Church Auto-Monthly (change to any month or year with click of button) Calendars and Offering Count Sheet free as a Bonus for purchasing Shepherdbase! Hurry and Enjoy these Savings! This great CD has all the free church forms, certificates, brochures, flyers...(650+) on FreeChurchForms.com along with 4 Bonuses as a Thank You for purchasing the CD all for one special price of $13.99 plus shipping and handling ($7.00 in the U.S. or $27.00 outside the U.S.). Free church forms, certificates, flyers...(650+ forms each in PDF and Microsoft Office Word 2007 or higher version format - some in Excel). Also continually updated to include the latest forms created. The Church Office Package includes Shepherdbase - Church Membership Database and the Church Forms CD - 650+ Forms, Certificates...along with all the Free Bonuses for only $40.99 plus shipping and handling ($7.00 in U.S. or $27.00 outside the U.S.)! Hurry and Enjoy these Savings!